Getting rid of bees and other stinging insects can be a rather tricky proposition, especially if you're allergic to them. Angering a swarm of bees, or even one bee, can leave a person with painful stings. Instead of immediately approaching bees that are looking to take up residence on your property, it is wise to observe them from a safe location, such as a window inside your home, and then call Ozark Pest Solutions for removal. Do not spray, throw rocks, or attempt to discourage their presence in any way at this point. Ozark Pest Solutions performs bee and stinging insect removal from walls, roofs, attics, chimneys and other odd places bees nest in. At times, we also provide removal on trees, bushes, and other exterior locations. Bee removal is often dangerous and difficult; although bees are mostly found under eaves, they are much different than wasps. A few bees in the house or bees buzzing around a chimney, vent, or eave is usually sign of a beehive. An established beehive typically will consist of 10,000 to 50,000 bees. An average beehive can have 25 to 100 lbs of honey and comb. If the bee colony has just appeared and is congregating outdoors, it is called a swarm. In the lower half of the United States an average swarm may be about 5,000 bees and about the size of a football and often beard shaped. For the remainder of the United States and Canada, the swarms are generally larger. 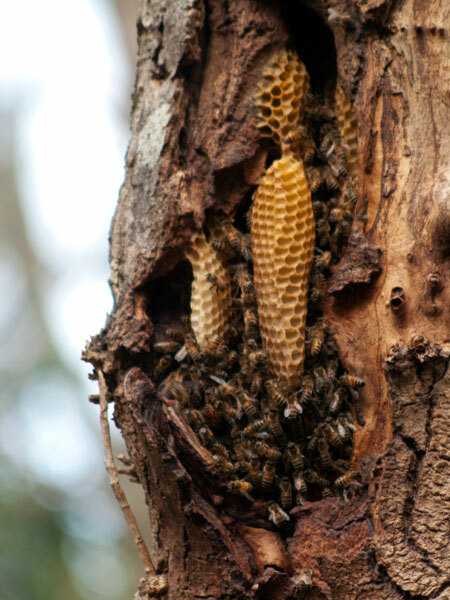 In the case of a swarm, it can be best to leave it alone; bees will typically rest on a tree, bush, or an external structure for a few days before moving on. If the bees have not left within a few days, bee removal is the next option.